3D printers are relatively new on the consumer market, and they have come down in price such that some dental offices are able to have these printers in their office and print appliances for use in the mouth. Last time on America’s Dental Expert Podcast we talked about bite splints being just one of the appliances that are able to be printed in a dental office. Why is this 3D printing important in a dental office? Typically most dental work is snail mailed and hand delivered. Impressions (or moulds of your mouth and teeth) are mailed to dental laboratories, then the dental work is done and mailed back to the office. This can create some problems because large orders from dental laboratories can get mixed up in between patients. There is also the time to mail back and forth and it’s not a very good allocation of patients’ time. We all have busy lives and busy schedules and making yet another dental appointment to get some dental work installed or cemented or delivered can be very time consuming. So printing these appliances in office cuts down on the number of patient appointments that are needed, and it also respects the patient’s time better. Instead of waiting three weeks to get a bite splint, would it be advantageous to get it the very next day? Maybe on your way to work or the next day on your way home? Respecting our patients’ time is the first advantage to having a 3D printer in the dental office. 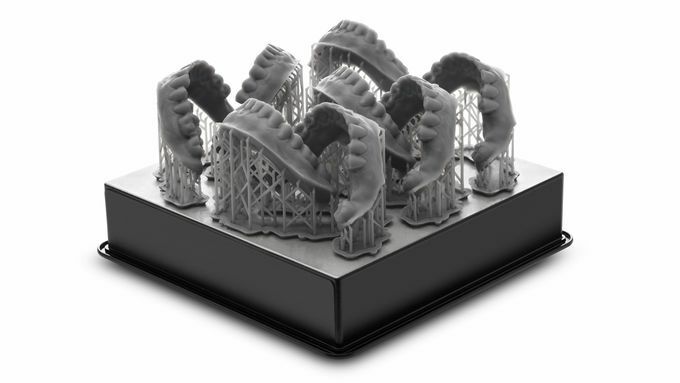 The second advantage to incorporating dental 3D printed appliances is patient finances. If i have to send an impression to a dental lab (pay for the shipping) and pay the dental lab for the appliance and the time, labor, and man power to make that appliance, that increases the overhead and the end cost to the patient. It increases our lab fees. What 3D printing allows is dentists to create or manufacturer appliances and restorations in-office at a fraction of the price in less time. Lower overhead and lab fees means dentists are able to pass those savings on to patients, resulting in lower cost dental care to patients. Additionally, in my office, let’s use bite splints as an example, most regular offices you would get a single bite splint for the fee. In my office, you actually get two bite splints. If you lose the first one or take it on vacation and forget it in the hotel, you have a back up already, so you get twice as much. Twice as many appliances in my office and it’s kind of a safety net or back up for you. Additionally, if you lose your second one or break the second one, instead of having to start the entire process over again by taking an impression and sending that to a lab again, we can simply open the file and print it again. Long term we’re cutting down on the number of office visits that are required for patient care and patient treatment. I hope you consider going to a dental office that utilizes the newest 3D printing technology to offer you better patient care, customer service, and an overall better experience at the dental office.